I first became interested in minimalism a year or so ago. I have always been a hoarder and a naturally messy person, so when I discovered minimalism, I thought it sounded so freeing. When you have always had too much stuff and have never had a consistently clean room, you can easily begin to feel trapped by all your stuff. Recently, I realized that I had only barely dabbled in minimalism when it comes to my living space. I suddenly had a great desire to really clean up my room so that I no longer feel trapped and claustrophobic in my home. I’m still going through that process, but I’m getting a clearer vision of how I want to make minimalism a reality in my living space. I recently got kind of obsessed with a blogger and YouTuber who posts about minimalism, and she suggested writing down some reasons you want to pursue minimalism to help you find more motivation to actually change your lifestyle. Once I followed this advice and started writing, I realized that there are several reasons why I believe minimalism will improve my life. So I’m going to share the most important reasons with you. This has been such a huge issue for me for such a long time. For years I have attached my identity to my taste in clothing or home decor, and my overall “aesthetic.” It may sound crazy, but I’ve often thought that my social media profiles (like Pinterest and Instagram, and Tumblr during my teenage years) were somehow attached to who I was as a person. But that is so not true. My tastes have evolved so much over the years, so it has often felt disorienting when I’ve realized that I no longer liked the same things. I also felt a sudden urge to buy a whole new wardrobe or completely redecorate my room when I experienced one of these aesthetic transformations. Clearly I was way too focused on outward things, when those things actually say very little about who I am as a person. Fashion and home decor and other artsy things should be sources of fun and enjoyment, but they should not stress us out, and we should never look for our identities in those things. As a Christian, my identity should be rooted in Christ, not what I’m wearing or what my room looks like. Those things are all so temporary and fleeting. The dangerous thing about attaching your identity to material items is that you feel constantly compelled to accumulate more stuff. As our tastes are always changing, we feel that we need to go shopping every time we realize we want something new. But in order to save money, we have to realize that outward things don’t determine our worth or our identities, therefore we don’t need to buy a bunch of stuff every time our tastes change a little bit or we find a new trend we want to try. It takes a lot of self-control to stop yourself from going shopping every time you want to reinvent your style, whether it be fashion or home decor. But once you learn to practice this self-control, you’ll end up wasting so much less money on things you don’t really need. One of the biggest problems with consumerism is that it encourages ingratitude. You are always reaching for more, and nothing ever feels like enough. You think that once you change your room or buy that new item of clothing you’ve been wanting for ages, you’ll feel better. And maybe you do for five minutes, but the excitement soon wears off, and you no longer feel grateful for what you have. I want to appreciate things I already own. Instead of looking at girls with huge closets or perfect bedrooms and feeling ungrateful, I want to be grateful for my own little corner of the world and the things I already have. Ingratitude is really just a form of self-pity and selfishness. We get so focused on all the things we want that we stop caring about others and those who have much less than we do. When you practice gratitude, you take the focus off of your own desires and become empathetic and aware of those who would be thrilled to have half of what you have. And then you can hopefully become more generous and actually give to those people. Although I resisted minimalist home decor for a long time, I finally believe that a room with less chaos is definitely more conducive to a calm mindset. When you have too much stuff in a room, your eyes don’t know where to go first and you can begin to feel rather claustrophobic. For so many years I’ve been afraid of having any open space in my room because I thought it would make it feel cold or boring, but now I’ve realized that having too much stuff going on in my room has made it feel messy and chaotic. I want to create an environment that feels calmer and less cluttered. I want my room to be somewhere that I feel relaxed and free of anxiety, not anxious because of all the mess around me. I have too much stress with school to be constantly stressed about how my room feels out of control. I have always had a natural tendency to get depressed. I am not naturally a very energetic or motivated person, so I often get days when I feel like I don’t want to move or do anything, and I feel so down and unmotivated that I let my room turn into a pigsty and have no energy to clean it. I’ve found that this is a vicious cycle for me. The more messy and cluttered my room gets, the more I feel discouraged and unmotivated. Having mess everywhere makes me feel like a slob, and then I feel even more depressed and lose all motivation. I believe that if I have a clean and tidy living space, it will make me infinitely more productive, particularly academically. Piggybacking on the last point, I want to have less stuff in my room so that it’s easier to tidy up. The more crap you have in your room, the more difficult it is to clean it. I got so used to seeing junk everywhere in my room that pointless items just began to blend in. I’ve been looking into the KonMari method of tidying, and Marie Kondo (the creator of this method) says that you should have a definite home for every item in your room. I realized that so many items in my room didn’t have a particular place where they belong but were just carelessly strewn around, therefore cluttering up my room and creating an absolute mess. I want tidying up to be easy and quick. I don’t want cleaning my room to be a constant source of stress and anxiety anymore (which it has been for years). I want to have less stuff to organize and put away, and I want less items to ruin the overall look of my room by cluttering up my floor and surfaces. Being attached to material things adds such a weight to your life. You always feel tied down because you’re basing your identity on outward things. When you let go of material things and have a healthy detachment from them, you begin to feel freer. And you begin to see that the things that matter most in life are not material objects. I want to feel so detached from material things that if my house burnt down, I wouldn’t be gutted about all the things I lost. That sounds kind of grim, but we should always be aware of the fact that material things aren’t eternal. The reality is that we can’t take any of this stuff to the grave. We should never put too much value in objects, because they’re just items and they’re not what truly bring us happiness. So those are the main reasons why I want to pursue minimalism. This post was more focused on the home decor aspect, but some of these apply to minimalism in a broader sense. I hope that you got some inspiration or motivation from this post and that you also decide to live more simply. If you guys have any other reasons why you want to pursue minimalism that I didn’t talk about, I would love to hear about them in the comments below. I struggle so much with this. I have always been messy, hoarding is in my genes. In fact I would love to have a job of shopping for vintage stuff… but that’s just it, it’s stuff. I want to be like Jesus. I can’t exactly do that toting tons of stuff and having attachment to things. Good luck in your minimalist endeavors. I think I’ll clean out my closet this week. Haha. Ah I can definitely relate! I think it’s probably possible to have a job like that as long as you can practice self-control and not let stuff take over your whole life. Yes exactly, He was completely detached from outward things. But as most of us are living in homes, it’s difficult to not get attached to stuff at all. It’s definitely a process. I still have such a long way to go. Thank you, good luck to you too! I think cleaning out your closet can be really fun and refreshing. Aww thank you so much! Your blog is great too. I just checked out a couple of your posts and I really enjoyed reading them. Yes exactly! It’s so important to take it one step at a time. I think loads of minimalists haven’t yet reached their goals but slowly work towards them, which is a less stressful way of doing things. Thanks, it’s been going fairly well thanks. I hope your minimalism journey is going well too! Hi! 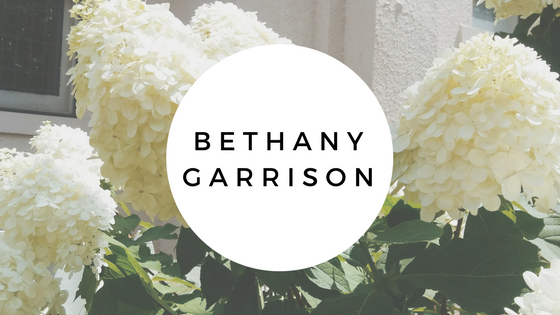 I’m Bethany, and I’m a twenty-two-year-old college student who wants to use my love of writing to share my faith and encourage believers to live more simply. A week ago I found out Jennifer Garner is speaking at my graduation and that is literally the only thing making me look forward to graduating. Which is just kind of sad really. What's wrong with the "Jesus and coffee" trend? "People go to Christianity for comfort"